I'm building one of them for a community build on another forum. I've done too much to enter it in this GB but it's got a scratchbuilt DOHC cylinder head on the 12.7 litre Bugatti straight eight and huge blower on a sheet metal manifold. *Last year's International Boring Object competition (organised by the Bruge Boring Society) was uncharacteristically dramatic due to a schism between those who thought large grey cubes were more boring that small ones and those who thought the reverse. The large grey cube faction held that, since a grey cube was boring, a bigger grey cube was more boring. The counter-argument was that a smaller grey cube was less visually arresting and less of a nuisance than a large one, therefore making it the more boring size. The discussion went on for three days and was only resolved by the committee declaring both large and small grey cubes the joint runners-up, with the discussion itself taking first place. Fine. Just remember it has to be a whiff. I just had a brilliant idea. How about T6/SNJ/Harvards as World War II era racing aircraft for each branch. Think demo colors. 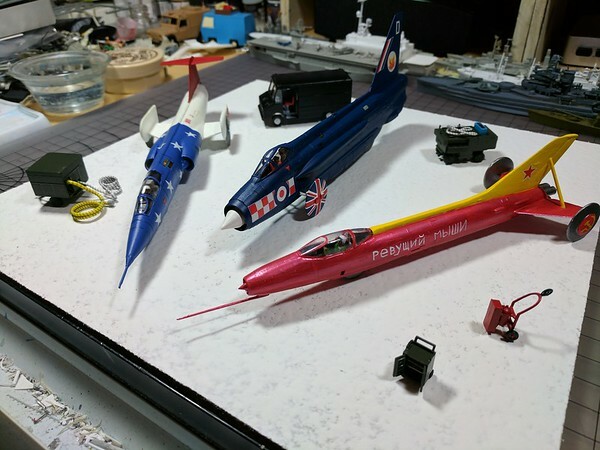 USAAF: black and gold, USN: Blue Angel Blue and Yellow, USMC: red and yellow, USCG: royal blue with white and red racing stripes, RCAF: Snowbirds scheme, RCN: Yellow and ?, RAF: Red Arrows scheme, FAA: ? Nice idea. There have been several RN display teams, the only two I know with special paint schedule are the Sharks which flew Gazelles in dayglow orange with a black fin and a shark motif, and the current team, the Black Cats who fly lynxes. The lead ship has lynx artwork over the standard grey paintjob. Watch "Shogun Tango" and you'll see the future of the racing competitions. I liked bashing these together for the Old Kit GB. While grovelling in The Loft looking for car engines for my JPS Racing Team I came across this tiny zip lock bag containing a MINUTE aircraft kit. As you can see it's more flash than model mould, but you can just about make out the shape. It's a Midget Mustang, a 1948 designed single seater built for Goodyear Trophy pylon racing, and almost 500 of them have been built it's going to be pretty difficult finding a colour scheme that's a Whiff, but I'll have a go anyway. Oh yes, it's just under 2" long, engine to rudder! The kit's by Meikraft BTW, and the 'instructions' are a just a small sheet of paper that tells you what it is, a tiny build diagram, but no colour scheme drawings, no nothing. Just remove everything that doesn’t look like your subject. The kit looks like it just might be N-scale, Kit. On my laptop screen that pic is LARGER than the model! 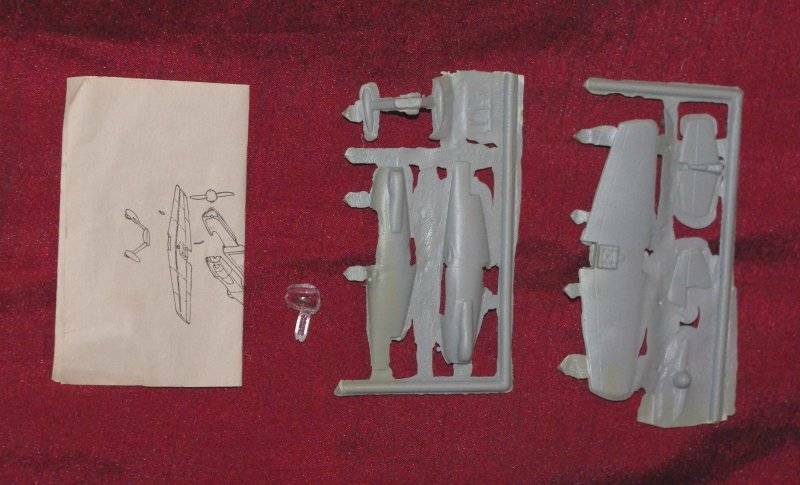 It really is 1/72 though, the Midget Mustang is only 15 ft long.